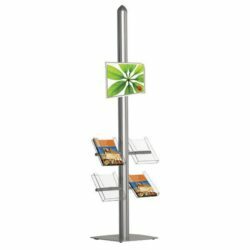 Free Standing Displays Stand with 22″ x 28″ Poster Size Snap frames and 2 x 8.5″ x 11″ Steel Shelf Single Sided. Each part is Silver. Profile thickness of Snap Frame is 1″. 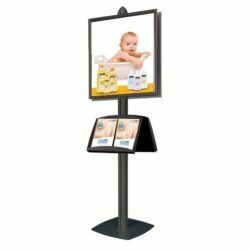 Pedestal stands are multi-functional sign holders that complement the presentation of marketing material by displaying advertising content to customers in more than one format. 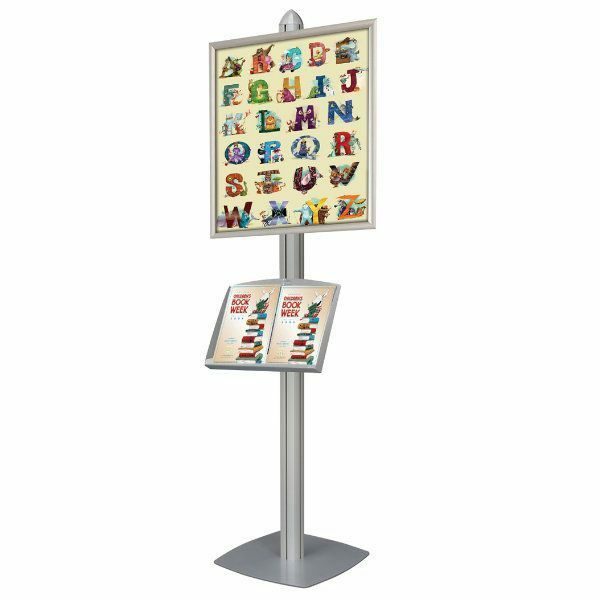 Pedestal stands combine a sign holder with a literature rack and a snap frame. 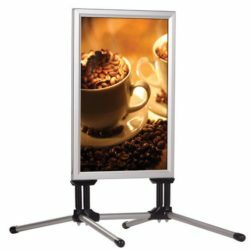 The sign holder of the pedestal stand presents with the following features: it is a snap lock snap frame that enables quick and efficient rotation of graphics; the silver snap frame will support graphics of dimension 22″w x 28″h; it is a single sided sign holder complete with a non-glare lens to confer maximum visibility of prints. The literature rack of the pedestal stand is constructed as follows: the silver steel shelves are of dimensions 2 x 8.5″ x 11″; the steel shelves are height adjustable Ð there are four channels along the central pole with capacity to support the steel shelves, thus allowing users to specify the appropriate height for their leaflets. 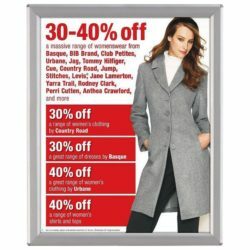 When the snap frame sign holder and literature rack are combined, the two create a 75-inch-tall poster holder that presents a contemporary design that is easily accessible to customers. The primary intention of the pedestal stand is to use the sign holder to attract the attention of clients and then to offer customers the opportunity to learn more about the products presented by taking away one of the informational leaflets held on the steel shelves of the literature rack. It is the perfect amalgamation of sharp, attention grabbing marketing that also offers detailed, informative content, with product specifications outlined in the information leaflets. 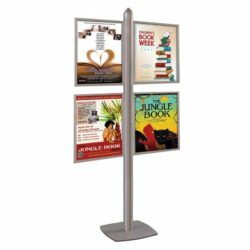 The pedestal stand is appropriate for any number of indoor business and commercial environments, and, with the adjustable shelve channels described above, the poster holder is a versatile product that allows the user to tailor the presentation of their marketing content to their own specific needs.